I have always been hesitant to “show off” my work to people. It’s not something that comes naturally to me. 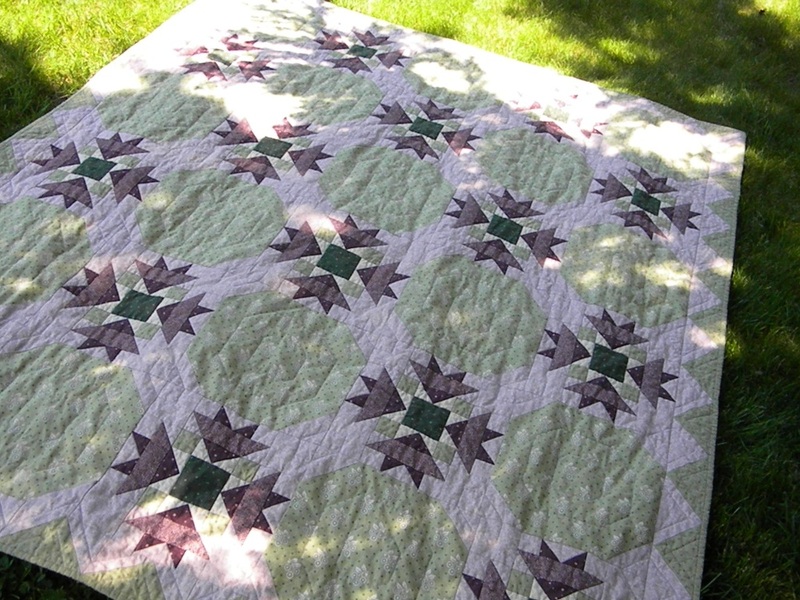 I have been working on that a lot lately using this blog, twitter, and flickr to show photos of my completed quilts and other projects. It’s one thing for me though, to show a photo online and to have people say “oh, how pretty!” and something else altogether to willingly bring in something I have made and have it judged. The thought of someone judging my work terrifies me to no end. Last year I had a conversation with someone who said to me “you need to put your work out there where people can see it and touch it. You need to be open to criticism and be open to getting your feelings hurt in order to succeed. If you never put yourself out there, no one will ever see how wonderful you are.” Granted, this person was a family member so they have to say I’m wonderful, but his words really struck a chord with me. He encouraged me to enter a quilt in my local fair. Here’s the thing about my local fair. It’s the Puyallup fair. It’s the largest fair in Washington state. It’s a tad bit, um, intimidating. I talked to my friend Lizze (who also happens to be my biggest fan) and she encouraged me further. I decided to go ahead and jump in with both feet. I knew right away which quilts I wanted to enter. 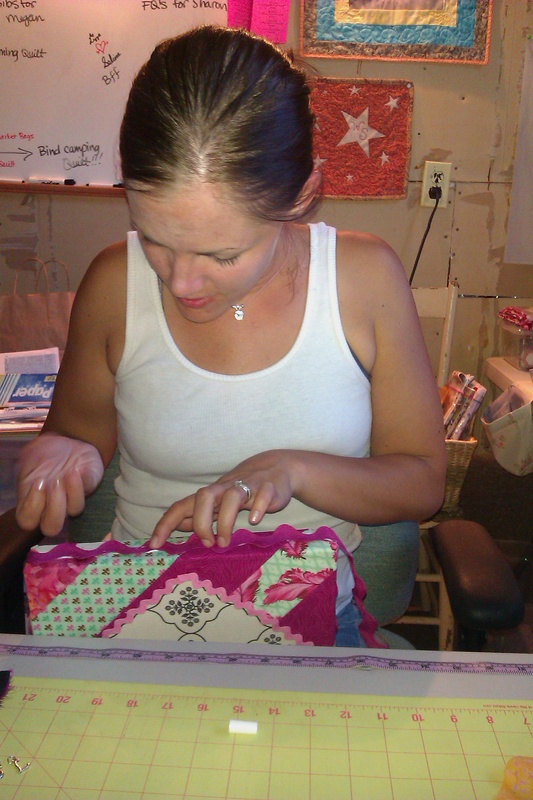 I spent the day yesterday hand-stitching labels and hanging sleeves to the back of two fairly large quilts. After church this morning I drove the few blocks to the fairgrounds and my stomach started to knot up. I remembered the message from service and played it over in my mind “Only a fool would wait for the perfect time”. I bit my lip, grabbed my bag, and went inside. Phew. Now comes the nail biting and the anxiousness of waiting to hear how they did. I’ll have to keep myself plenty busy so I’m not constantly thinking about it. It’s a good thing I have so much sewing to do! Selina and I were invited by the wonderful folks over at Fat Quarterly to participate in a designers challenge. We weren’t sure what it was we would be doing, but of course we said yes! We aren’t ones to turn down a challenge. We were sent a printed canvas from Basic Grey and some buttons to play with. We were told we could use it anyway we wanted. We decided to make the most outlandish, bright, and bold canvas we could come up with. 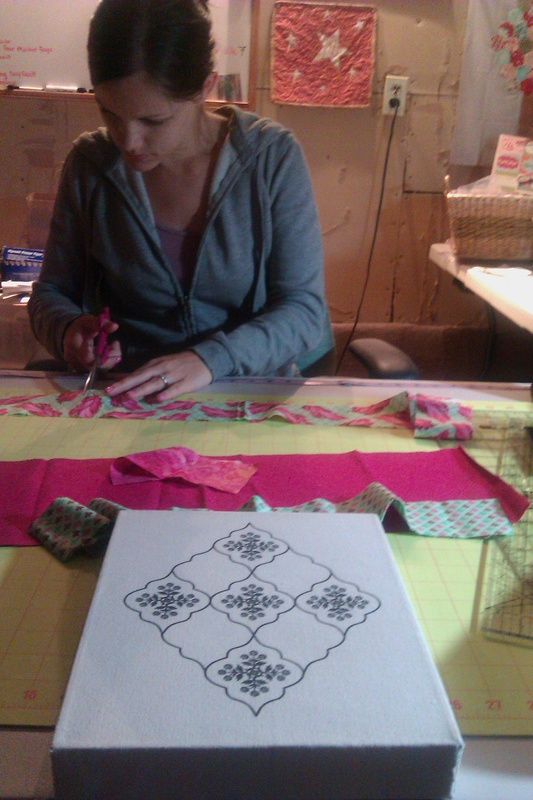 We love Tula Pink fabrics so we wanted to incorporate some bits of it that we have used in projects of our own. 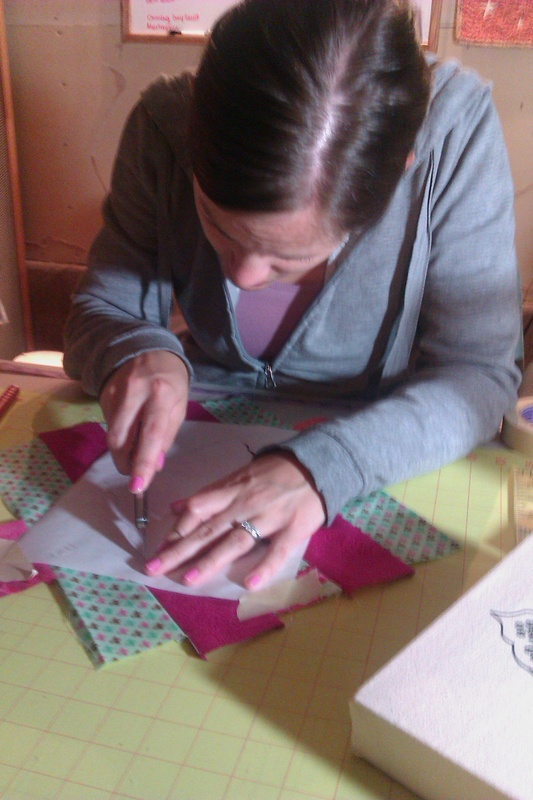 Selina is making me a quilt using the Plume fabrics, and the pink we chose is a fabric I used with Parisville to make a bag for her last Christmas. This is the way the canvas looked when we started. 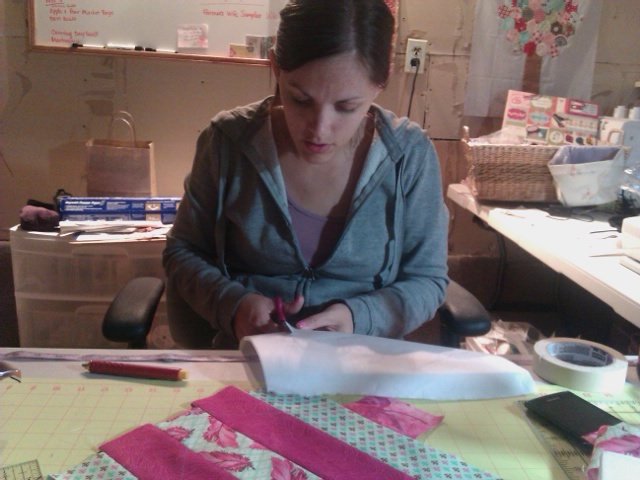 Selina is pictured in the background, cutting up the fabrics we decided to use. At first we were unsure where to go with this, but we assumed that other designers would be pretty tame and stick to the original plan of just showcasing buttons and small bits of fabric. If you know anything about us, we are not tame at all. We wanted to do something completely different with it. 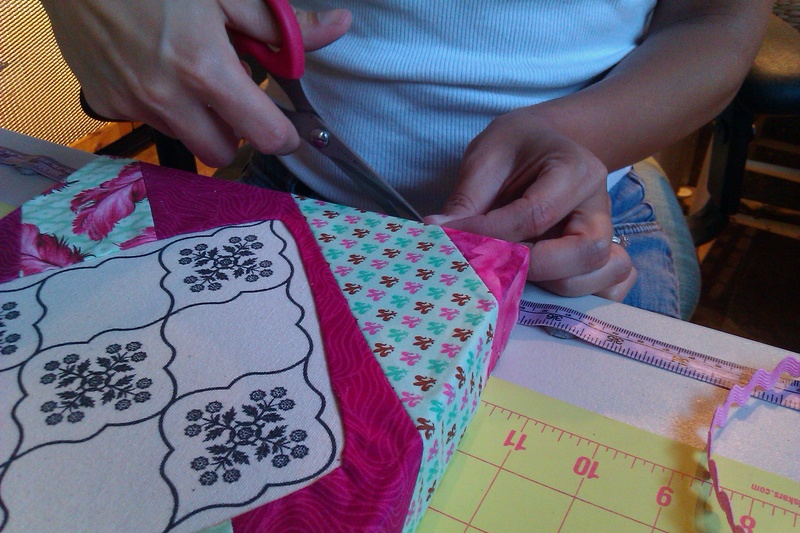 We chose to sew strips of our fabrics together and cut around the design in the middle. We were originally going to leave a raw edge, but it didn’t look quite right, so Selina folded the edges under and we used a fabric glue to hold it in place. And who doesn’t love ric rac?!?! I know we do! Here’s Selina gluing down the ric rac around the edges. 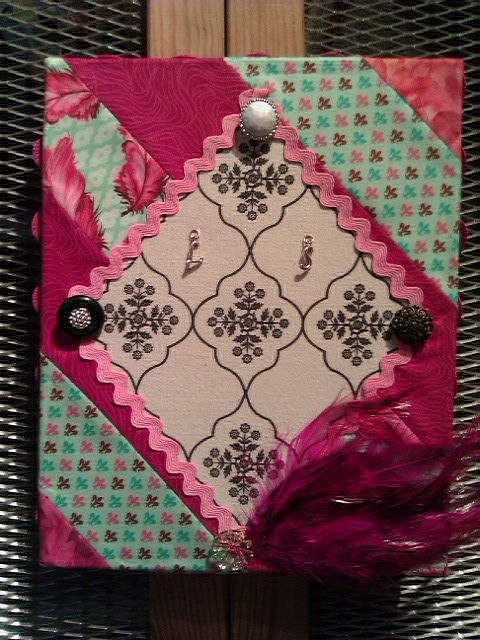 We used a light pink ric rac in the center, and a jumbo ric rac in fuchsia around the outside. Time to stitch down the buttons. We chose the fanciest ones that they sent us to make it look like bling! And is that a feather?!?! Why yes, it sure is! We also got some letter charms, one letter “L” and one letter “S”. You know, like Laverne and Shirley! This is our finished product. Crazy, just like us! We had so much fun making this! It might be a bit too over-the-top to win any prizes, but we love it and it will hang proudly in my sewing room. Every time I look at it, I will remember the great times we had together working on it. Thank you Fat Quarterly, for the chance to work on something like this. We hope it’s the wildest, most outlandish entry, because that would certainly be fitting for us. 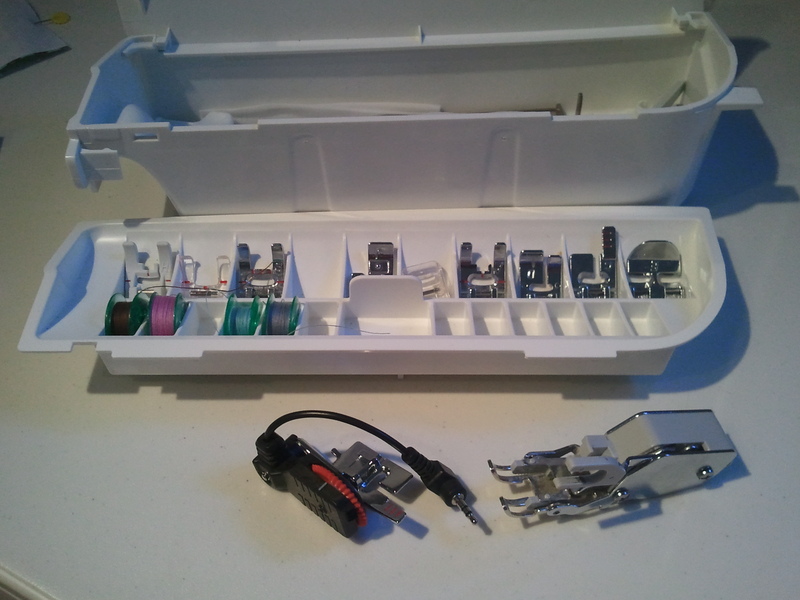 There is a dream sewing machine that every quilter has. It’s not the same machine for all of us. 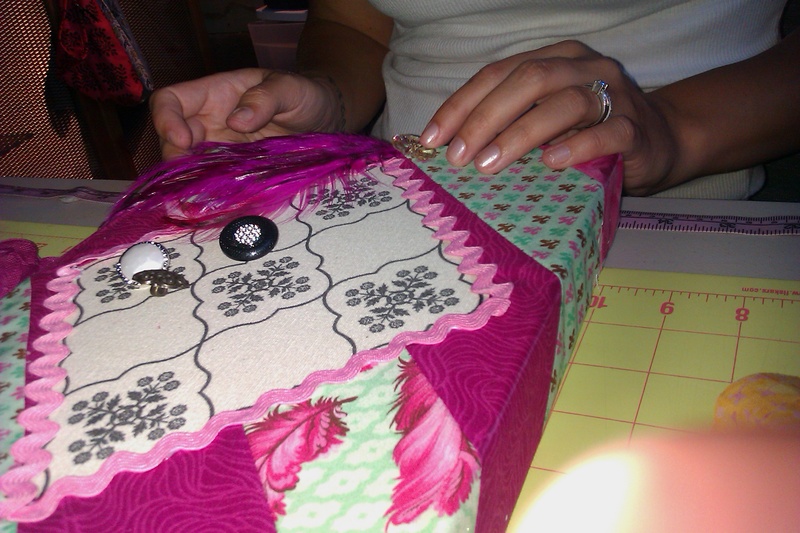 A sewing machine that would make quilting so much more enjoyable and take some of the extra work out of it it for us. 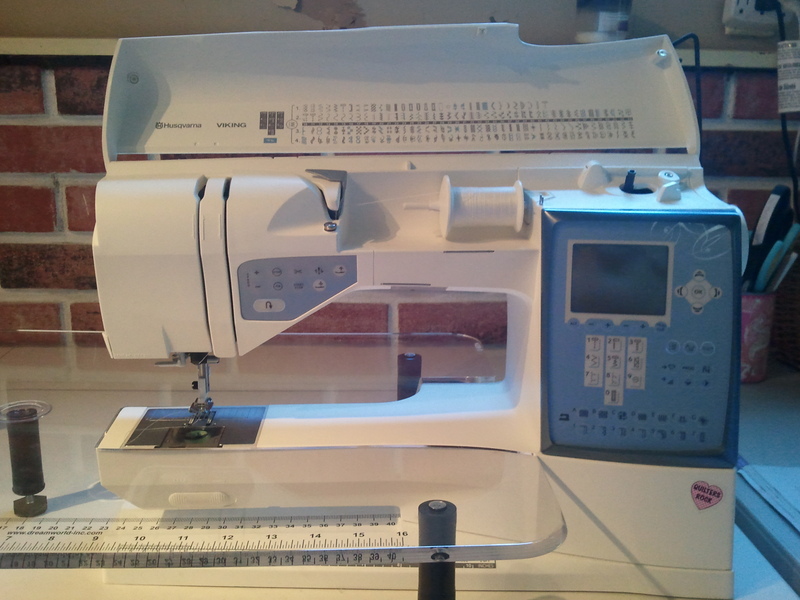 For me, this dream machine is a Bernina 440QE. This machine, brand new, is right around four thousand dollars. Throw in the walking foot that I need for attaching binding and straight line quilting and that tacks on an extra hundred and fifty. So, this is a pricey machine and one that has always been out of my reach. 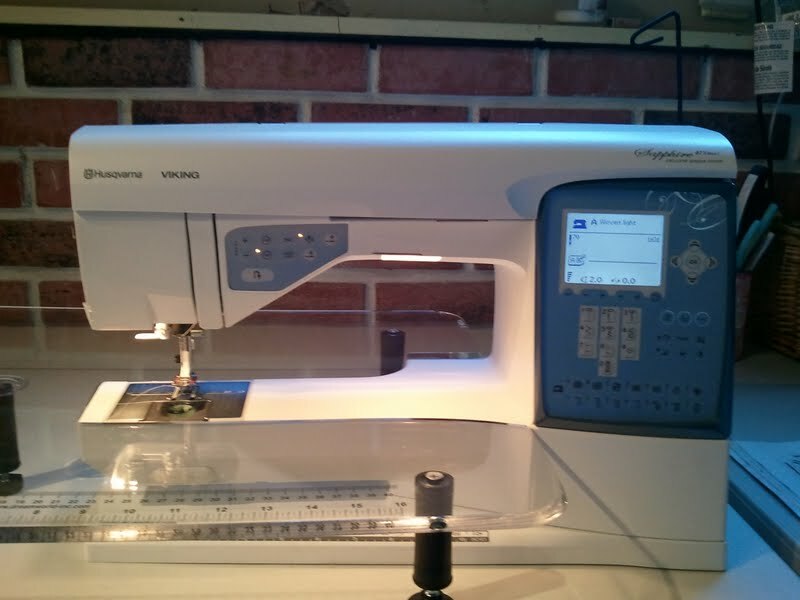 A year and a half ago I got the okay from my husband to buy a new sewing machine. I lusted after those Berninas… oh yes, I did. But I couldn’t afford one. I ended up taking home the next best thing. I was so happy to leave the store that day with my Viking Sapphire 875. She is a gorgeous machine and has so many really great features. This is Ingrid (she’s German so she had to have a German name, you know.). Her and I have had some great times together. 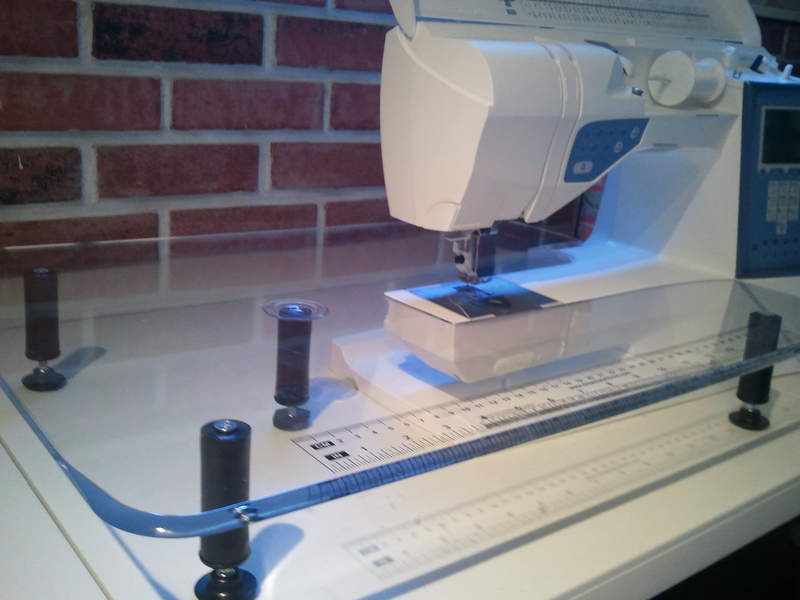 But the Bernina was my first true love. I wasn’t looking to cheat on her. I really wasn’t. But you know how these things go. I left the shop, but her words kept echoing in my mind. Taunting me. I literally couldn’t sleep. I mentioned it to my husband (in a room far away from Ingrid so she wouldn’t hear of my treacherousness) and he said if I sold my beloved Ingrid, I could then have Bernie. I placed ads on Craigslist, facebook, harassed my friends on twitter, but to no avail. No one wanted my poor Ingrid. I couldn’t get Bernie out of my mind. I wanted her. I had to have her. So I came up with an ingenious plan (or so I thought). I worked out a way to bring Bernie home before I had actually sold Ingrid. I guess you could say that they are now sister wives – for now. I can only handle one lady at a time here, two are just a bit much for me. Plus, my husband is overrun with estrogen in this house so something has got to give. Not to mention that he isn’t speaking to me until Ingrid has packed her bags and left town. It’s time for Ingrid and I to break up. She has been wonderful and we’ve shared some good times, but we have to move on. We’ve made peace and said our goodbye’s and she is ready to be with someone else. She has been serviced, oiled, all cleaned up and spiffy. She comes with lots of presser feet and can do so many amazing things. Also included is a genuine Husqvarna/Viking walking foot (cause, you know, a lady can never have too many designer shoes), and an 18″ x 24″ sew steady acrylic extension table. She can be yours for $2000 (or make me an offer I can’t refuse) – plus shipping if you don’t live in the Seattle area. http://www.husqvarnaviking.com/us/17053_17194.htm <—– Click this link to download an extensive list of all of Ingrid’s many features and benefits. 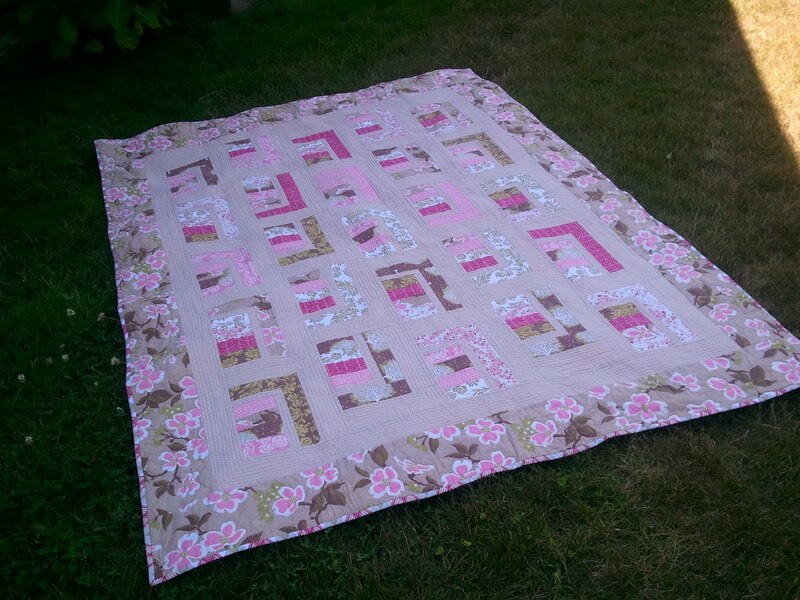 She has been wonderful to me and has made some gorgeous quilts. I will miss her greatly. Someone please give her a good home?